The cast of Crimes of the Christmas Pudding at Garrick Theatre, Lichfield. Photo: Pamela Raith. New Old Friends has a growing reputation for producing comedy murder mysteries to die for and Crimes of the Christmas Pudding can only enhance that reputation. Very loosely inspired by the work of Agatha Christie, the plot sees a series of murders being committed at a country house, where an ace Belgian detective (a female one in this case) happens to be on hand. Step forward Artemis Arinae (a superb Jill Myers). 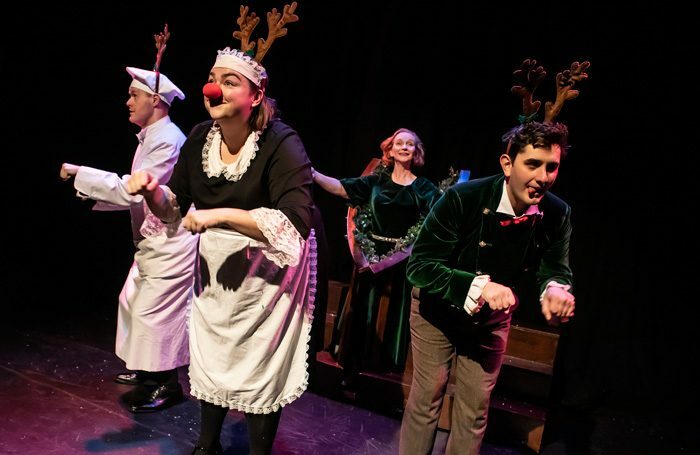 Feargus Woods Dunlop’s lively script contains countless clever puns and hilarious innuendos, delivered by an excellent four-strong cast, three of whom play multiple parts, requiring instant costume changes as they morph from character to character. But this is so much more than just a crime story with jokes – with its mad-cap plot, fiendishly clever word-play and an assortment of crazy characters, it’s in a league of its own. Despite occasional lapses in pacing, it makes for very funny stuff with an emphasis on physical comedy. Laura Crowhurst is particularly entertaining as Molly Maid. The show fits snugly into the Garrick’s studio theatre. The limited space requires an inventive use of props. This results in a scene with a vertical bed and an ingenious conjuring of an aeroplane. In true Poirot style the murderer is unmasked at the end but after all the laughs, who doesn’t really matter whodunit.